Victoria Glass's ingenious vegetable peel pakoras are a wonderful solution to combatting food waste. 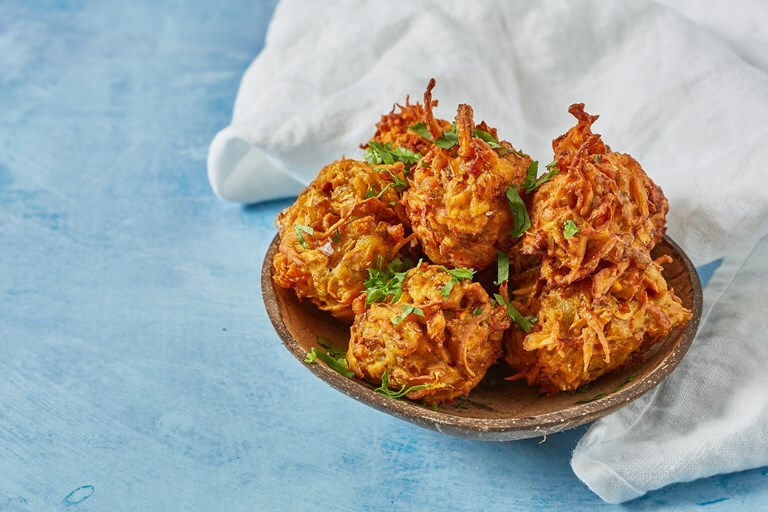 Perfect served up as a starter for a vegetarian Indian feast, the crisp fritters are full of aromatic spices. Check out Victoria's other tasty ways of using up fruit and vegetable peel here. These spiced fritters are a fantastic way to give a new lease of life to your veg peelings. If you're not a fan of deep-frying these pakoras can be oven-baked instead, but they won’t be as crisp and moreish. Used cooking oil can be strained through muslin and safely re-used many times. But once it starts smoking, forming a layer of foam on top, starts looking dark and dirty or smelling unpleasant, the oil should be safely discarded (but don’t pour it down the sink! Most burst sewage pipes are caused by people pouring fat down their sinks) or recycled to make biodiesel, animal feeds and detergents. Some companies will even pay you to collect it; if ever there was an incentive to recycle your cooking oil, that’s got to be a big one.